Once the ice has melted off your pond, and temperatures have been consistently above 5°C for a week or more, it’s time to open up your pond or water garden for the Spring. Check the pond for any damage and remove leaves and debris. Clean the pond with a net or Pond Vacuum being careful if fish are present. Water lilies and aquatic plants that over-wintered can be cleaned and repositioned and re-potted if necessary. If adding new water make sure to condition the water to keep your fish safe from chlorine or water impurities. Prepare your filter with beneficial bacteria to jump-start the biological process and re-connect your pump. When starting your pump and filter check for any leaks that might have occured during the winter. 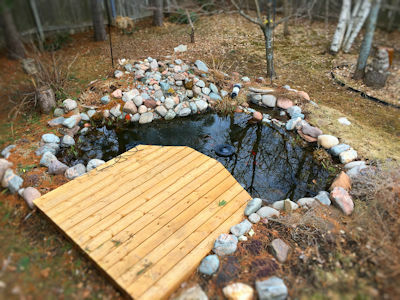 Add a Spring Cold Water Cleaning Bacteria to breakdown remaining sludge and a start-up bacteria to re-colonize beneficial bacteria in your filter; liquid barley extract will help keep your pond water clean and clear. If you have an UV Clarifier or Sterilizer to prevent green water, replace the bulb and clean the quartz sleeve that covers the bulb. Do not turn the UV unit on until the bacteria have had at least 48 hours to colonize. You can begin feeding your fish when water temperatures remain at 10°C or higher. Feed fish sparingly until they begin to show signs of a normal metabolism and hunger. The cold water wheat germ fish food is a good food to start in the Spring. Now with 3 Models! A pond vacuum can make cleaning muck and sludge from pond walls and rocks an easy job. Two of the original models of PondoVac are available, the Classic PondoVac and the the best selling deluxe PondoVac 4. Both pond vacuums complete with various cleaning accesories. See below f.. Custom Cuts of Pond Liner Price Includes Free Shipping in Canada and All Canadian Taxes Included. *** Liner length must be in increments of 5'. 45mil EPDM fish safe pond liner, the industry standard. Fish-safe Firestone liners are the toughest liners available. Don't take chances with..
Bareroot Hardy Water Lilies available April 1 – June 30th These bare root hardy water lilies are perfect for any water garden because of their perennial beauty, ease of care, abundance of bloom, and variety of colour and form. We have chosen a selection that tolerate partial shade to accomod.. Concentrated pond dye product that safely colors water while its enzymes assist the beneficial bacteria in your pond to create a healthy pond environment. Specially formulated to safely color lakes, lagoons, decorative ponds, fountain & water features a beautiful shade of blue! Enz..